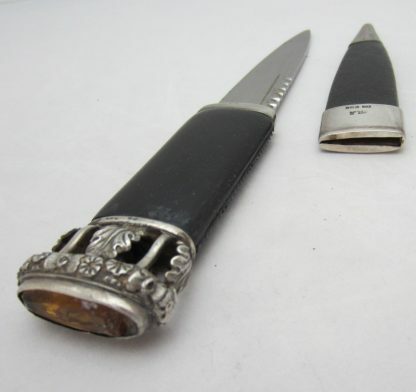 There are sterling silver fittings on this 1961 Sgian Dubh. Around the pommel, there is open cutwork in a leaf design. The stone in the pommel has a chip out of it. The sterling silver hallmark can be found on the back of the sheath. This 1961 Sgian Dubh has sterling silver fittings on the knife and the sheath. The hallmark is on the back of the sheath. There is open cutwork around the pommel with a leaf design. There is a sterling silver hallmark in on the back of the sheath.